Which is larger, a micro-average or a macro-average? Not knowing the answer for many years until recently when I sat down and worked it out, in fact in a more general sense, for non-averages as well, let a,b,c,d refer to any real number with d>=b>=0. 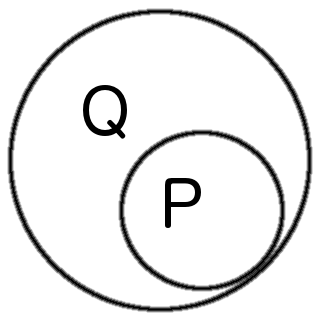 equality holds, and inequality inverts, in both simultaneously. okay okay, all my friends laughing at me, I know this is silly little math exercise you did when you were in a diaper… whatever!! TODO: generate general case averaging n ratios. Holiday season 2012, wishing everyone a happy new year. Merry Christmas. It takes a moment to convince one’s self that the smallest set “Confucius wants” fits inside what “I want”. 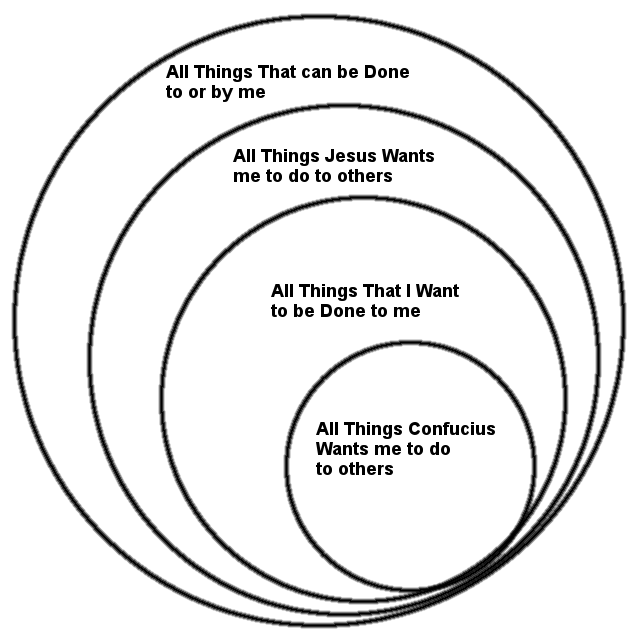 But if you image the outside of “Confucius wants” is Q above in the negative space and outside of “I want” is P in negative space and is therefore superset to Q.
reside—those things within my ability to do to other and to be done onto–suddenly we find that these sets of actions: things I can do, things jesus wants me to do, things Confucius wants me to do, and things I want to do, have a superset relationship. The large sets are always proper super set of smaller sets unless I want done to me include all possible things or nothing. It’s kind of surprising that Confucius silver rule recommends doing fewer things than Jesus’s golden rule–But then again, it may make sense, Confucius speaks much of humbleness, about learning from teachers, he puts greater value on meta-knowledge about one’s own knowledge than the knowledge themselves. Perhaps this conservative valuation of self prevents him from doing as much.